It’s difficult for working moms to find time took a whole table’s worth of food during busy times. 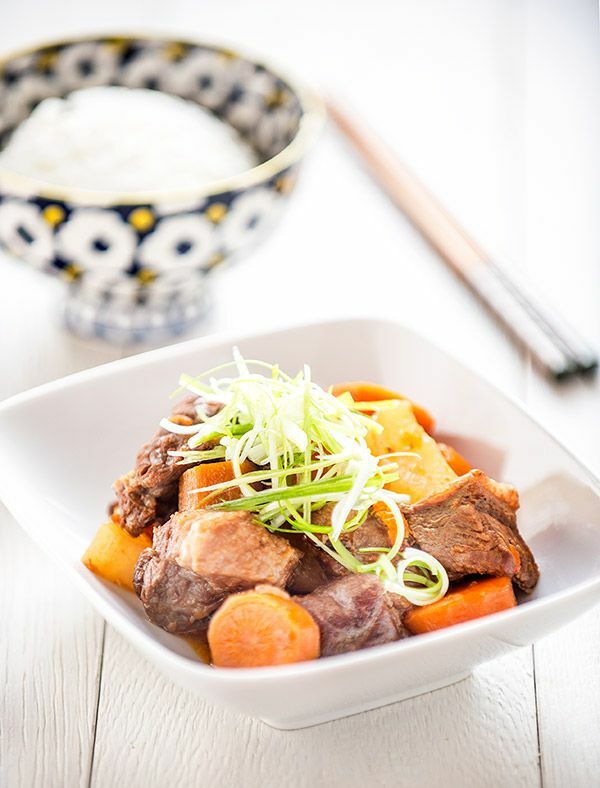 So when it comes to “what’s for dinner” one of our favorite dishes to cook is this Chinese daikon, carrot, and tomato beef stew (紅白蘿蔔蕃茄燉牛肉). You can prepare this dish and store it in the freezer, so, whenever you’re hungry, just defrost and re-heat it. You can serve this dish with either rice or noodles, and both ways are delicious but different. This dish is a lifesaver for the working mother: re-heat it, cook some rice in a rice cooker for 30 minutes, and the dish has all the nutrition your family/friends need. You don’t need to worry if there are enough vegetables or proteins in your food. We've always been a big fan of stew, and this beef stew is one of our favorites. The traditional way of making this in Taipei is to add some dried orange peel because, apparently, the dried orange peel will make any kind of meat soup or stew taste better. You can also put dried orange peel in slow-cooked pork dishes. It really does make the pork taste better. Unfortunately, it can be tricky to get hold of dried orange peel (Chenpi, 陳皮), so this recipe doesn’t contain any. The stew tastes amazing with or without. If you don’t like daikon, you can leave it out or replace it with potato. The flavor will become quite different compared to using daikon, but, again, either way, is really delicious. Boil a big pot of water and add the beef. Boil for 5 minutes to clean any dirt off the beef. After 5 minutes, use cold water to wash away any dirt on the surface of the meat and drain the water. Leave the beef aside for later. Heat up 2 tablespoons of oil and stir-fry the ginger and onion until the fragrance comes out. Add the beef and stir-fry for another 3-5 minutes. Pour the rice wine in and cook for 30 seconds. Add light and dark soy sauce and bring it to boil. After step 3 has boiled, add tomato, water, star anise, cinnamon stick and orange peel (optional). Bring it to boil again and use medium-low heat to simmer for 1.5 hours. Check and stir it often. If you think the water is a bit low in the pot you can add a little bit hot water to adjust it. The beef should be nearly soft after 1.5-hour cooking and then add the carrots and daikon. Cook until the carrots and daikon are soft and this dish is nearly ready. Check the seasonings to suit your taste before serving.